Driving is serious business and requires your full attention. At all times, obey traffic laws. Not intended for unpaved, off-road use. **"As shown" $72,850 MSRP. MSRP excludes destination and handling charge, tax, title, license and options. Dealer sets actual price. Nissan reserves the right to make changes to prices at any time without notice. See dealer for details. Always wear your seat belt, and please don’t drink and drive. ©2008 Nissan North America Inc. They called it a Supercar, not me. 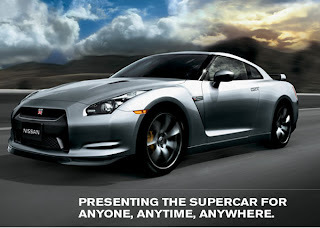 I signed up to be on the GT-R mailing list from Nissan NA's website.